The original Sony PlayStation was released 25 years ago and now you can own it again in its miniature form with the Sony PlayStation Classic Console. Approximately 45% smaller than the original PlayStation, the PlayStation Classic emulates the original's look and feel, right down to the controllers and packaging. Two of the original PlayStation controllers are included with this system, complete with four shoulder buttons and an ergonomic design with a comfort grip. The PlayStation Classic also features an HDMI port so you can connect it to your HDTV. While the Memory Card slot is just for show, each game can support up to 15 virtual memory card slots. Speaking of games, there are 20 classic PlayStation games that are pre-installed on the console. Please note that an AC adapter is not included. Box Dimensions (LxWxH) 9.1 x 9.0 x 3.8"
PlayStation Classic Console is rated 3.7 out of 5 by 15. Rated 1 out of 5 by Jason from Sony phoned this one in. And reversed the charges. I dont think Ive ever submitted a review before, but seeing as how there arent any others, I may as well start now. That said, this is such a lousy product, I really just want to tell you to avoid it unless you want to hack it by running your own games off a USB stick. Check out the numerous reviews on YouTube for details on how badly Sony marred their own reputation with this one (e.g. title selection, lazy/cheap emulation, wrong default region settings, lackluster interface, no apparent Q.C.) by contracting this job out--according to the consensus theory. Luckily, theres an easy controller hack you can access (Select & Triangle--but wasnt intended for the consumer?!?) that at least allows you to play games with the proper frame rate, but when ultimately compared to either of Nintendos retro minis, this one is much closer to something AtGames would typically be known for. In short, its a very disappointing effort for something that had so much potential to compete with Nintendo, and the recent 50% drop in price (100 to 50 bucks) certainly reflects that. I sent both of my units back due to these defects in software, but will probably pick a few up at this price point, if only for the hardware. Hopefully, however, Sony will learn from this complete lemon of a product with all the returns heading back. Rated 5 out of 5 by Josh from Despite Negative Reviews, if youre a techy, this is Perfect Ive read so many negative reviews that I almost didnt purchase this. I am glad I did, and especially from BH Photo, who had the best price as well as Free Expedited shipping! This system in its normal state is pretty poor even for $59.99. But if you do a little work, you can get US versions of games on this machine that run better, and you can add games that you legally own as well. I recommend getting the Onvian 3 Port USB Hub High Speed Splitter for $9.99 as well as the SanDisk 64GB Ultra Fit USB 3.1 Type-A Flash Drive SDCZ430-064G-A46 for $9.99 Link right here: https://www.bhphotovideo.com/c/product/1384373-REG/sandisk_sdcz430_064g_a46_ultra_fit_usb_3_1.html A Google search away will get your system to be actually worth using and putting some time into. Do yourself a favor and stretch yourself, its definitely worth it! Rated 1 out of 5 by Robert from Even on sale...was not worth it I was very excited when this product went on sale for what I thought was a very reasonable price. Little did I know that the graphics would be horrible....I grew up playing PS1 and PS2 games and I do not remember the graphics being this bad, and that was way back before high-def TVs. The game play doesnt seem as crisp as I remember when I was younger either. Would not purchase again. Rated 4 out of 5 by Andrew from Let the Retro Gaming begin! Only complaint is there could have been a few more games however for the price I paid twenty games isnt bad either plus its HD now and its hackable! I think Sony knew what we were going to do with this console from the beginning and for that Im thankful. Easy setup and system works just as advertised. Also B&H had the best price on the net so I had to do it! Rated 4 out of 5 by Chris from Fun Brings back the old days of playing with my siblings and friends. I wish they had included some more games on the system but at least they have some good ones. Also Sony should have thrown in a usb power adapter, but is not like that anyone who has a cellphone doesnt a spare one laying around. Rated 4 out of 5 by Robert from About What Was Expected This little system does what it was made to do and is pretty nice. I find it pretty petty of Sony to not package a charge with the system, cheapskates. Nothing all that special and the anticipated sales at $99 must never have appeared and it is $55 pretty much everywhere now. Rated 5 out of 5 by Luis from Great Console!! Im satisfied with this console. I enjoy the games pre-installed and I believe Sony did great with designing it. I appreciate the work Sony put in to remind many of us of our childhood with the original console. Can you substitute your own wireless controllers? Only the PS USB controllers work. I suggest purchasing a regular USB extension cord. I bought 2 of them for only a couple bucks. The cord is way too short in my opinion, it doesn&rsquo;t reach from my TV to my couch. I tried using my Xbox controller and my PS4 controller, neither work. If you&rsquo;re considering, just buy yourself 2 regular USB extensions. Trust me, they definitely work and they make the cord 3x longer. How can it be powered with no adapter? Is there information on where to get one with this purchase? You can get a USB adapter from the web or use any phones adapter to power it on. 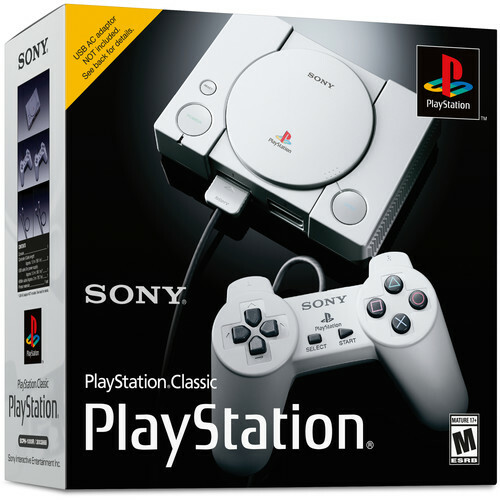 The PS Classic does not have built in batteries as stated by a staff member in a previous answer. Will reviews of the Sony PlayStation Classic be published? Especially negative ones like mine? Yew they will be published. can you install or play other games? You can add more games but might void your warranty. Google is your friend. Sorry, no, it doesn't, it's just like the NES Classic and SNES Classic and only has a number of built-in games. Can you install other games? Not by default. But you can if you are good at following online guides. Will the lid open and play original PS1 discs?